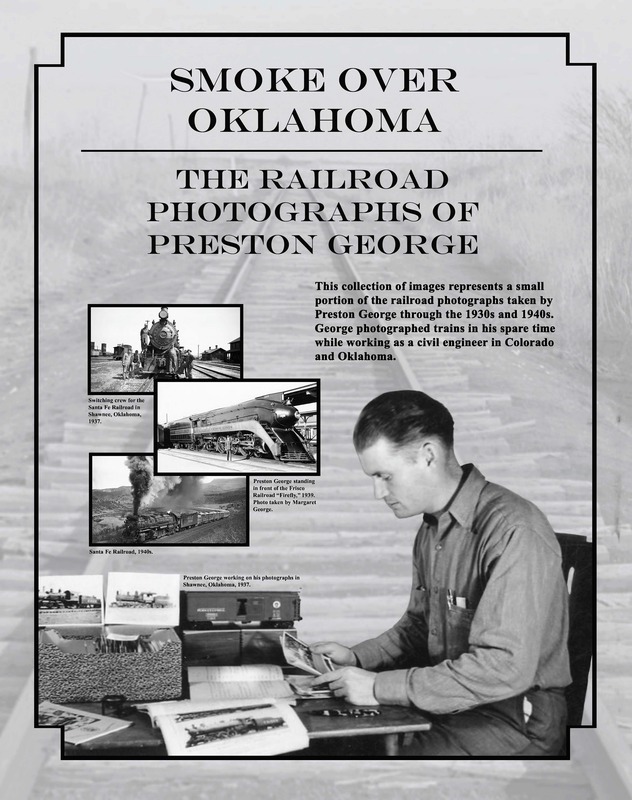 Visit the locations listed below to see the Oklahoma History Center’s traveling exhibits. One of the great powers of photography lies in its ability to connect us to our past and to signal how far we have come. They have the distinct ability to remind us of not only who we were, but also who we continue to be. 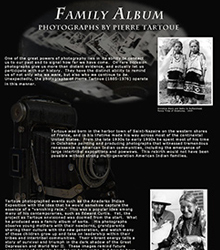 The photographs of Pierre Tartoue (1885–1976) operate in this manner. Tartoue was born in the harbor town of Saint-Nazaire on the western shores of France, and in his lifetime made his way across most of the continental United States. From the late 1930s to early 1950s he spent most of his time in Oklahoma, painting and producing photographs that witnessed a tremendous renaissance in American Indian communities, including the emergence of large intertribal expositions and powwows. This rebirth would not have been possible without strong multi-generation American Indian families. 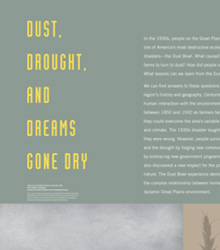 Dust, Drought, and Dreams Gone Dry was organized by the American Library Association, the National Endowment for the Humanities, and Dr. Jess C. Porter from the University of Arkansas at Little Rock. Part of the exhibit content was drawn from the Oklahoma State University library and features their Women of the Dust Bowl oral histories. Mount Holyoke College Library, which houses the Caroline Henderson papers (letters, essays and articles by a woman who farmed throughout the Dust Bowl) were also an inspiration for the exhibit. In the 1950s, increased television viewing and media coverage combined with his athleticism helped to propel Mickey Mantle into a superstar, often compared to Babe Ruth. The Oklahoma native known as the “Commerce Comet” exemplified the spirit of a hero through his determination, perseverance, and courage. The Daily Oklahoman extensively covered Mantle throughout his career and life. Oklahomans and baby boomers across the nation were captivated by his talent and sportsmanship. 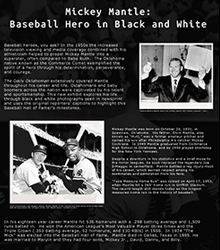 This exhibit explores his life through black and white photographs seen in newsprint and uses the original reporters’ captions to highlight this Baseball Hall of Famer’s milestones. Seventy-five years after Rodgers and Hammerstein adapted Green Grow the Lilacs into Oklahoma!, the duo’s first collaboration remains one of their most celebrated productions. Often considered the first modern musical, Oklahoma! reshaped the Broadway landscape and gave the state of Oklahoma national recognition, pride, and a song that continues to resonate worldwide. Social reform photographer Lewis Hine (1874–1940) spent thirty years photographing child labor across the United States. Hired by the National Child Labor Committee, Hine photographed children working in factories, mills, coal mines, farms, and in the streets to bring awareness to the abuse of child labor in early nineteenth-century America. Children were often severely injured or fatally wounded by the unsafe working conditions. Most of the children were kept out of school and many were illiterate. 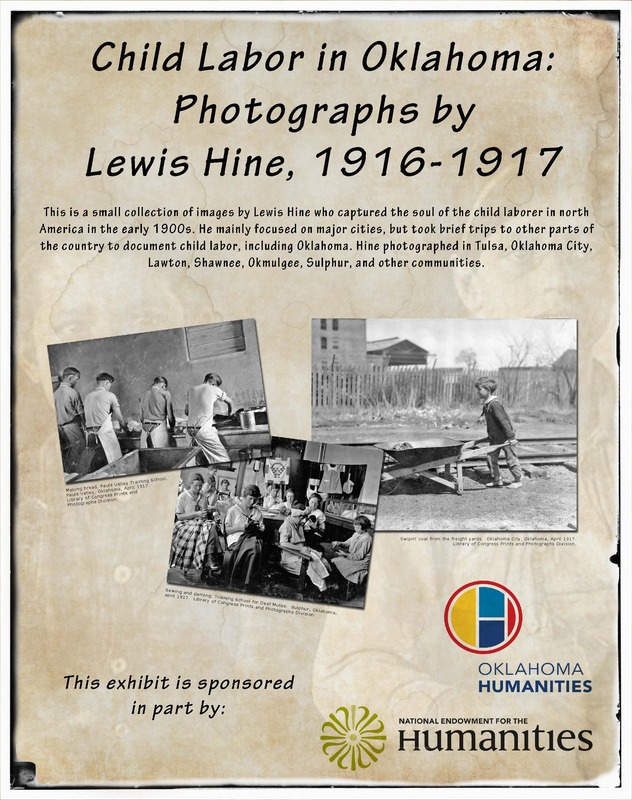 Although Hine focused on major cities, he did take brief trips to other parts of the country to document child labor, including Oklahoma. 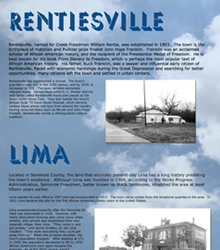 Hine photographed in Tulsa, Oklahoma City, Lawton, Shawnee, Okmulgee, Sulphur, and a few other communities. This smaller version of the All-Black Towns of Oklahoma exhibit highlights the thirteen towns that are still incorporated today. E. P. McCabe came to Oklahoma in the 1889 Land Run, he said, “to get away from the associations that cluster about us in the Southern states. We wish to remove from the disgraceful surroundings that so degrade my people, and in the new territory of Oklahoma show the people of the United States and of the world that we are not only loyal citizens, but we are capable of advancement.” The vision was to create an All-Black state. Although that never materialized, McCabe and others succeeded in establishing All-Black towns. The Oklahoma History Center offers several traveling exhibits on a variety of topics.